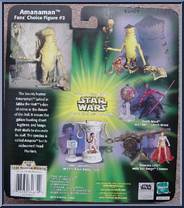 The bounty hunter Amanaman lurked in Jabba the Hutt's den of crime in Return of the Jedi. It scours the galaxy hunting down fugitives, and keeps their skulls to decorate it's staff. The species is called Amanin but is nicknamed Head Hunters. 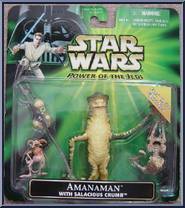 Contribute pictures, update details or suggest corrections for Amanaman with Salacious Crumb. Write a review about Amanaman with Salacious Crumb.